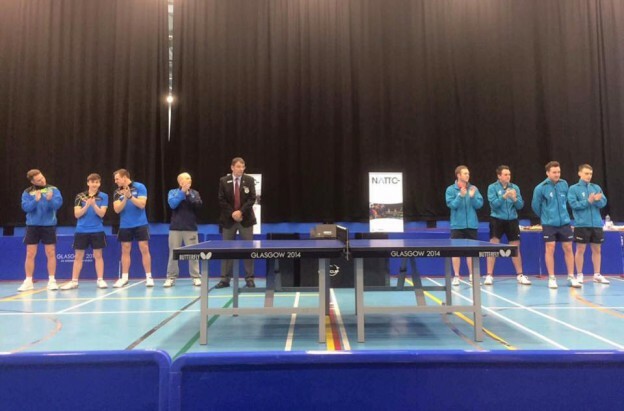 North Ayrshire Table Tennis Club staged the British League on Saturday 14th January against BATTS London – who sit in an impressive 3rd position in the league – was, for us, the best match of the season so far. We ran a friendly match for some of our junior players against a Glasgow before the match which meant they could witness top class table tennis afterwards – and the match did not disappoint. This was the largest turnout of spectators we’ve had so far this season with some of our junior players staying to watch after their friendly match in the early afternoon. NATTC’s team of Sean Doherty, Richard Main, Craig Hardie and Christopher Main were up against 4 top players from England. From the first game both teams looked up for it and the intensity was high right from the off. Sean and Craig picked up a good wins over Jack Bennett, both winning 3-2 and Chris Main scored a 3-0 win against Stephen Beerling. Adam Nutland (BATTS no.1 player) proved too strong for Sean and Richard. Peter Cleminson beat Craig 11-9 in the 5th set which could have easily gone either way, and Richard beat Stephen Beerling 3-1. This meant, going into the last game, NATTC were 4-3 up and Chris Main was playing Peter Cleminson for the win! The match went right to the wire with Peter eventually winning 12-10 in the 5th set in the match of the day to secure the draw 4-4 for BATTS. This put a slight down on the draw however we still feel this was a very good point for us to pick up. All of our players picked up a very good win each, playing some incredible rallies in the process against a very strong BATTS team. NATTC would like to thank all the spectators who came and showed their support, as well as the volunteers who helped stage the event. NATTC are now sitting in a credible 5th position in the league, with the next match at home to Cardiff on Saturday February 11th with more information regarding this match to follow. This entry was posted in Latest News on 24th January 2017 by Chris Main.